I wrote this post for Green Mountain Timber Framers' website blog in Dec. 2014. As I often refer to it and use the diagrams when I lecture and teach, I copied it here for easy accessibility - with a few edits for clarity. 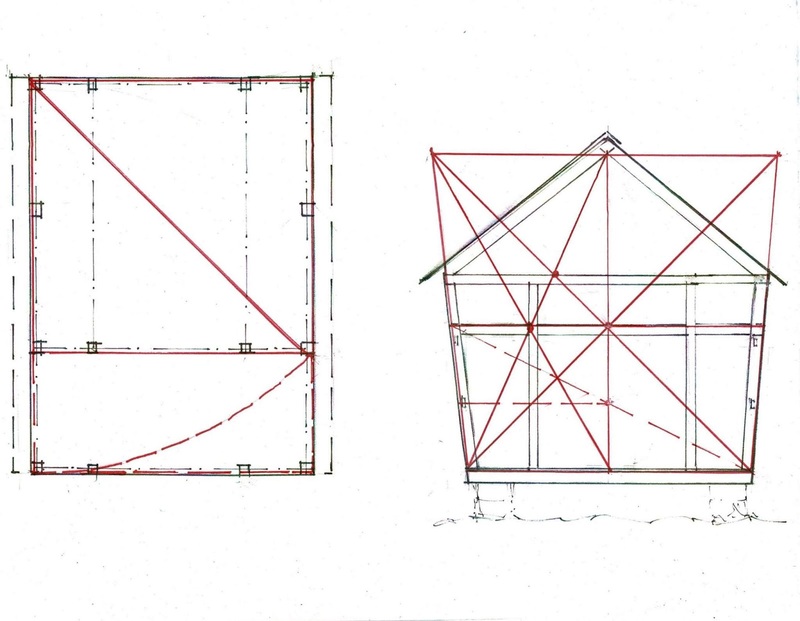 I invited myself to a Green Mountain Timber Frames barn dismantling in the fall of 2014. I wanted to watch it come down. I also wanted to investigate its geometry. 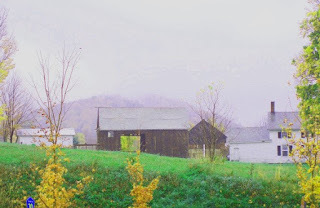 The three barns sat beside the road on the uphill slope of a valley, connected in an L shape. None of them faced the road on their west and windy side. Instead they faced south and east, creating a protected barnyard, a sun pocket. In the middle, protected from storms and wind, was the corn crib. Other farm buildings repeated the pattern, facing south, no doors on the west. 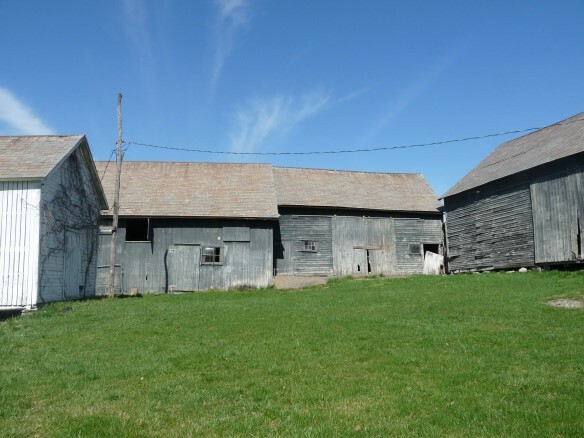 The main barn also had a door to the north, directly across from the one facing south. It fronted the farm road and looked at the house across the way. Two doors across from each other allowed for easy moving of machinery, ventilation and threshing. A north facing door was for bringing in hay and grain on the shady side of the barn in the summer. After we had climbed up to and down from the rafters, Dan McKeen (who then owned Green Mountain Timber Frames) handed me prints o f the measured frame. To have a sense of the building I checked some of the dimensions. The framers really did make his barn 30'-1" wide. He also made it 42'-6" long. Why those dimensions? Laurie Smith, the English Geometer, suggested that a layout using the diagonal of the square was the reason. 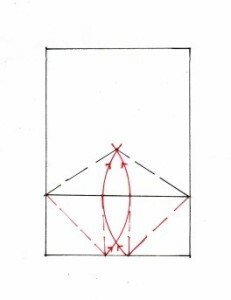 The diagram shows how a framer would have used that set of proportions (which is the square root of 2) to layout the floor. This is easily drawn. 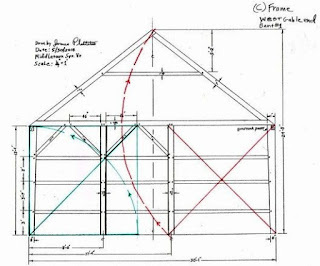 The rest of the barn frame comes directly from this diagram . 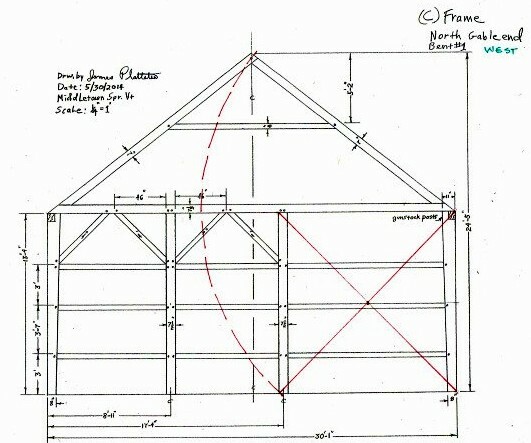 Both the extra inch and the square root are indications that the master carpenter for this barn used geometry to determine its size and framing. 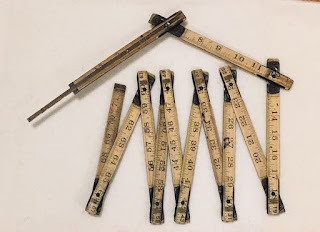 The ruler the carpenter used was not accurate by today's standards. Because he used Practical Geometry for his layout - proportions and relationships between parts, not fixed dimensions - it didn't matter. 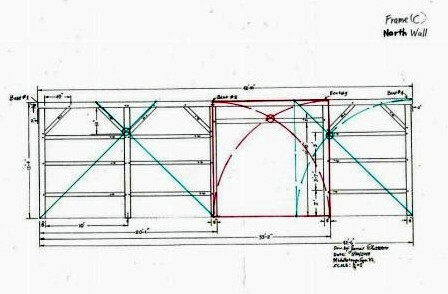 The second diagram shows the floor plan of the barn. The height of the new rectangle on the end of the square was a good height for the barn wall. So the framer drew a square in each corner. Using the diagonals for those squares he swung an arc on both sides. Where they met marked the ridge for the roof. 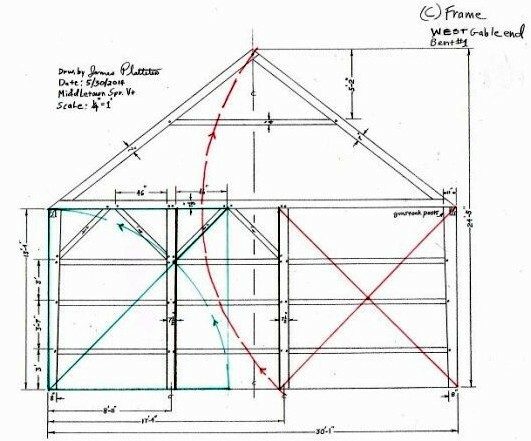 I have drawn the diagram as if the framer used the barn floor for his layout. Carpenters today use the floor of a house to layout the walls and the rafters for the roof above, so this is a reasonable assumption. 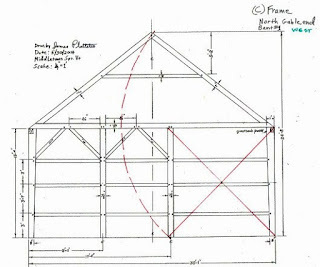 The measured drawings of the barn show how the diagrams were applied to frame the west end wall. The red X on the right is the diagonals of the original square. 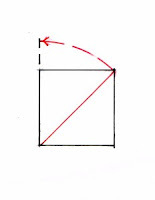 The DASHED LINE is the arc of the diagonal locating the ridge. The green DIAGONAL of the SQUARE on the left is cut by the green ARC of the length of the square. That intersection is the location of the left interior post. The east end uses the same geometry as the west end. 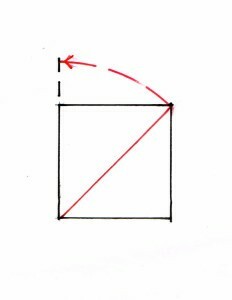 Here is the diagram for he diagonal cut by the arc. It is easy to draw and based on dimensions already being used by the framer. Locating the posts is straight forward and simple, easy to do with a straight edge, some twine and a way to hold the twine taut. The north and south walls also use matching diagrams. Shown here is the north wall. The RIGHT SIDE matches the layout of left end of the west wall shown above: the divided by its DIAGONAL AND ARC INTERSECTION,. 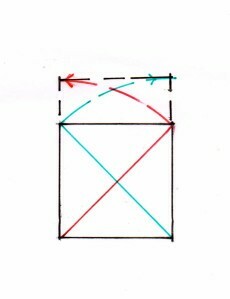 Then comes the SQUARE door opening; its lintel determined by the INTERSECTION OF THE TWO ARCS of the square. 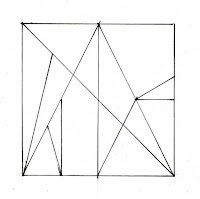 The left side was divided in half as shown by the DIAGONALS. 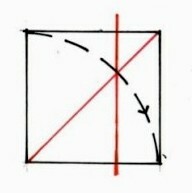 Note that the braces and the poles are also located using the same geometry: just turn the diagram above upside down. 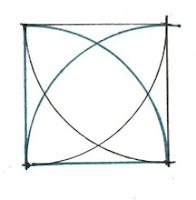 The diagram here shows all 4 arcs within the square. 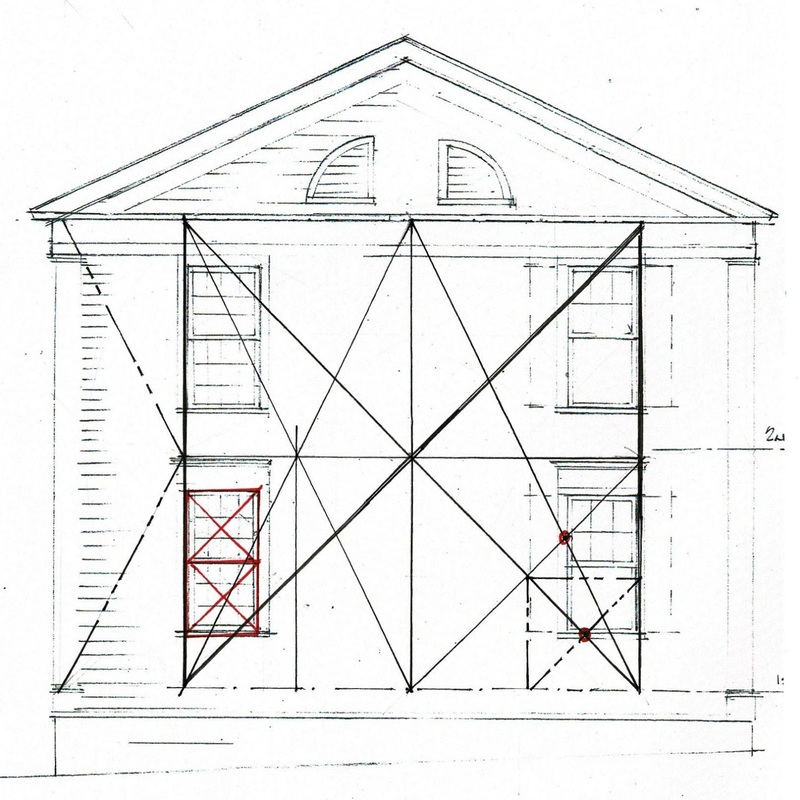 The measured drawings used here were produced by James Plastteter in May 2014. Platteter is a master furniture maker. His website is down, but his fine work can be seen by searching by his name. I used the Tuckahoe Plantation cabin as a my example. Its floor plan is composed of 2 squares. Its elevations come from the division of the square into thirds, easily done on a framing floor with cords anchored in place on each end. 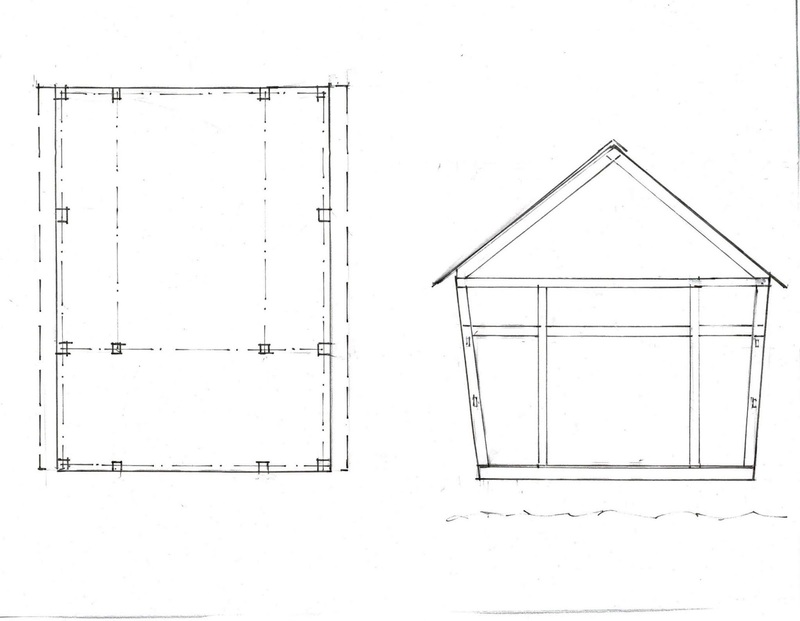 As long as the original length, here A-B, was on site to use as a reference, the cabin frame would fit neatly together. The windows however might be made by a joiner, off site. He could take a length of twine with him that matched A-B. But his windows would be smaller. How does he figure out the needed window size? He would refer to a daisy wheel drawn by the master carpenter. 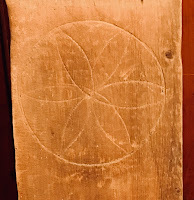 The diameter of the circle is a fixed length; the daisy wheel shows the craftsman where that diameter is. 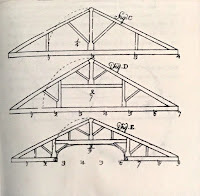 It is the Module, the Diameter, the Part described by Vitruvius and Palladio, referenced by the pattern book writers. 'P' on a drawing can also refer to the Latin 'pes' or the Italian 'piede', meaning 'foot'. Vitruvius, (Book I, Chapter II, Symmetry,) says. "Symmetry is a proper agreement between the members of the work itself, and relation between the different parts and the whole general scheme, in accordance to a certain part selected as a standard. ... In the case of temples symmetry may be calculated from the thickness of a column, from a triglyph or even from a module." 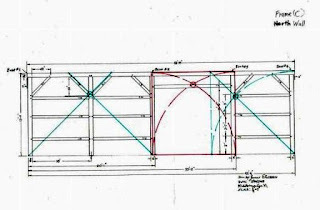 Asher Benjamin divides the lower chord in his truss diagrams into 4, 7, and 9 Parts. The Country Builder's Assistant, Greenfield, MA, 1797, half of Plate 29. 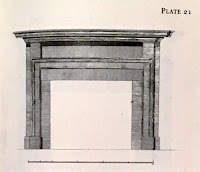 Owen Biddle adds a line below his fireplace mantle which divides the width into 5 Parts; and one of those parts into 4 smaller parts. The master carpenter chose his circle diameter - often a hand's breath, about 8", or from thumb to first finger, about 6". He drew his circle on a board and stepped the radius around the circle 6 times, swinging an arc each time. The pattern is a daisy wheel. Always, in every circle, the tips of the petals mark the diameter of that circle. The other carpenters could measure the diameter with a compass whenever they needed. The cabin width might be the daisy wheel stepped off 3 times, then that length stepped off 8 times. If the daisy wheel was about 8", the width would have been about 16 ft, a common size for small houses before 1850. The windows might be 3 daisy wheels wide. The joiner fashioning windows needed only take the daisy wheel's diameter with his compass and transfer that length to his work to make the window fit the cabin. Here I have counted off 3 units, then used that dimension to count off 10 lengths. Other daisy wheels have been found on roof and wall sheathing boards. 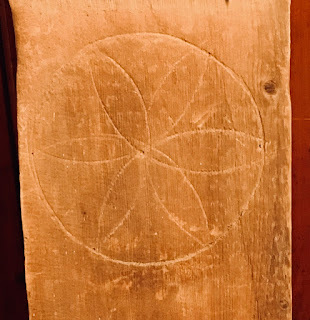 After a building was framed the daisy wheel was no longer needed but the board still was. Daisy wheels drawn for practice or perhaps to alleviate boredom also exist. This pattern is on a bedroom wall where it is known that someone was confined due to illness for a long time. It shows no signs of being used as a reference. The daisy wheel at the beginning of this post is on this board leaning against my breezeway wall. 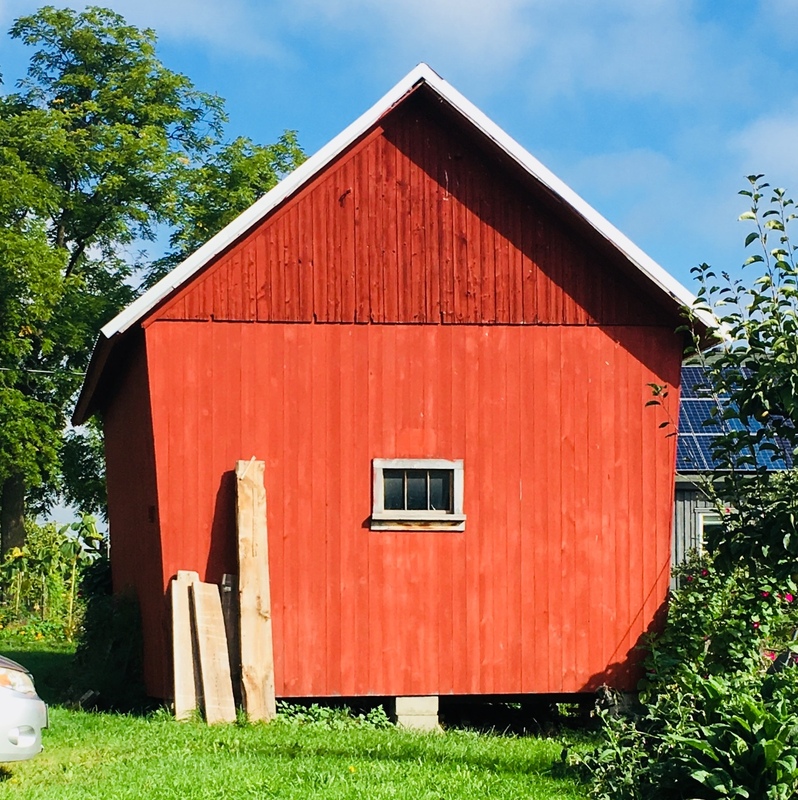 The 9 ft. tall sheathing board was part of an 1780 Vermont barn. The wheel was about 4 ft off the floor - easily accessible. It was drawn by compass; the center and the tips of the daisy's petals were regularly pricked. The radius and the diameter were used as dimensions. As it was in a protected and easily seen location it was probably also used for other buildings nearby. Its owner gave it to me. Vitruvius', Asher Benjamin's, and Owen Biddle's books are listed in my post of my bibliography. If you do not know how to draw a daisy wheel, the steps are shown here. #2 using the same radius, place your compass on the circumference - the line of the circle - and draw an arc. #3 Where your arc crosses the circle's circumference, place your compass and draw an arc. Do this a total of 6 times. #4 When you get all the way around the circumference you have made a daisy wheel. A copy of The Archimedes Codex was recently loaned to me by a friend who found it interesting. I agreed. I enjoyed the discovery, the history, the math and the science. I especially appreciated the chapter on the Stomachion, a puzzle I had not seen before. My grandson and I had fun with all the solutions. I already knew the square and the Lines of the Stomachion. 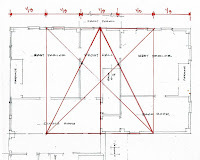 It is a geometric diagram used for layout and framing, part of Practical Geometry which was commonly used for construction at least as far back as the 6th century BCE when it is mentioned in the Bible. Practical and Theoretical Geometry were co-equal branches of the same mathematics, Vitruvius writes of how one informed the other. I cannot comment about Archimedes' understanding of the multitude of combinations possible for constructing the square. I can, however, easily see how to transpose triangles from one place to another in the diagram. Archimedes was a geometer and engineer as well as a mathematician. He would have known and used Practical Geometry as it was applied to the construction around him in the 2nd and 3rd Centuries BCE. His understanding of geometry, theoretical and practical, should be part of the discussion. Perhaps he was thinking about the lines as well as the shapes. A person of his ability could have considered both effortlessly. 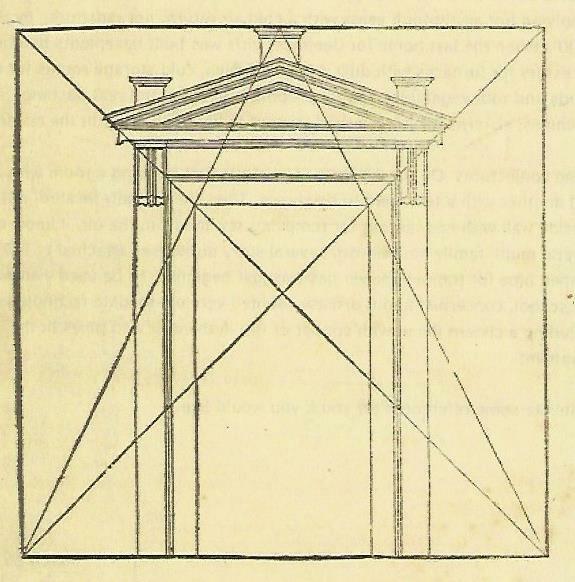 The Stomachion reminded me of this drawing by Sebastiano Serlio, from his book Architectura, published in France in 1537. He is discussing how to add a door to an existing facade. 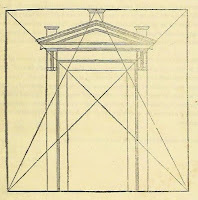 The diagonals and the lines from center top to the lower corners determine the size and placement of the door and its 'ornaments' - Serlio's word. 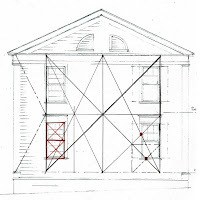 In 1821, the same lines were used to layout the Weathersfield, VT, church. 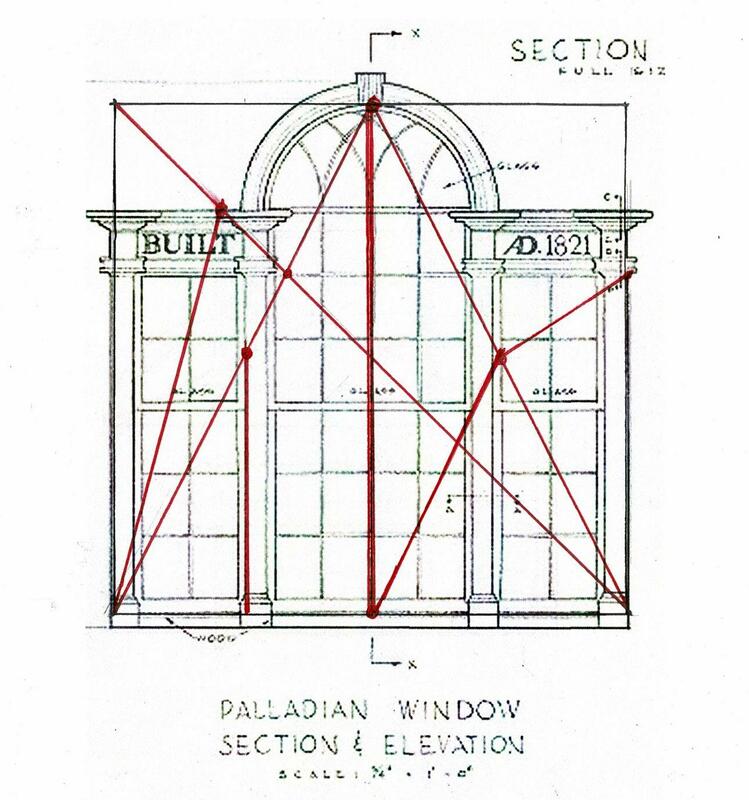 Here is its Palladian window. I have added the Stomachion lines which apply to its proportions in red. 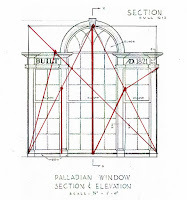 Practical Geometry used lines to determine both design and structure: the size of a building and its framing, its ornamentation. These drawings show how the lines of the Stomachion were determined. They are not random. The first 3 squares focus on the right side which is half of the square. The red lines are the diagrams extended. First, the Stomachion. 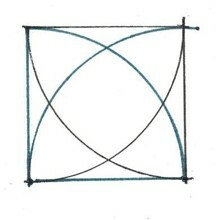 Second, the square divided in half using its center line. Third, the location and layout of the small triangle. Note that all the lines depend upon 2 points. I really enjoy the 3 similar triangles flipping back and forth along the line. In the second 3 squares focus on the left side. Second, the diagonals of left hand half, and then that half divided in half again. Third, part of the original from the upper left corner which determines where the left-hand angled line (also a diagonal) stops. Archimedes knew the shapes were proportional to each other. He must have know the lines. Were they so commonplace that he doesn't mention them? And we do because we've forgotten them? Perhaps someone else has seen how the Stomachion relates to Lines, how these lines come from dividing a rectangle into parts, how this is Practical Geometry - perhaps even Theoretical Geometry. I would like to meet that person. 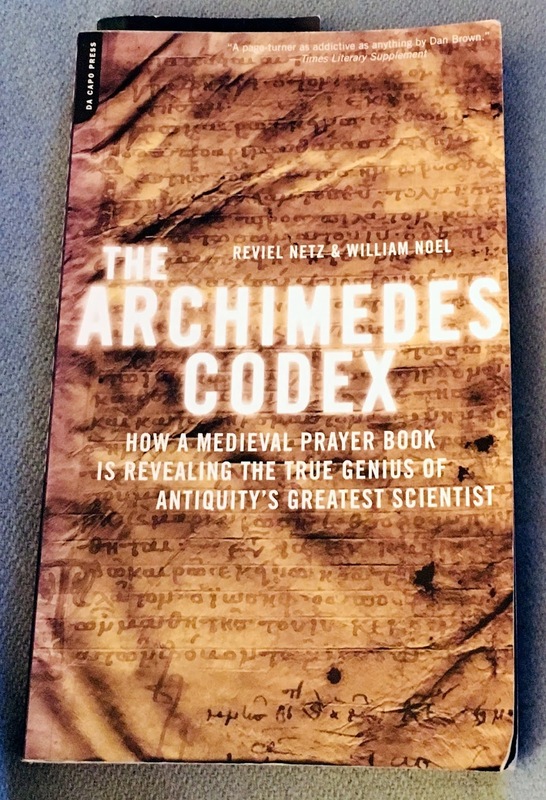 The Archimedes Codex, How a Medieval Prayer Book is Revealing the True Genius of Antiquity's Greatest Scientist, Reviel Netz & William Noel, De Capo Press, Great Britian, 2007. * quote from page 255 of The Archimedes Codex. We may have forgotten how to use geometry, but we still use the concepts and tools. 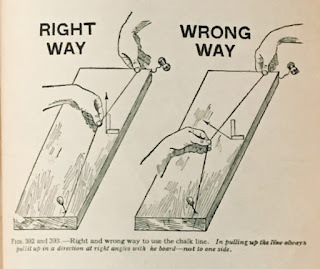 Every carpenter knows :1) how to use a Line, 2) why to lay it out, 3) how to pluck the twine at the right angle. We learned to snap the Line from someone else, not a book. This is hands-on teaching - master to apprentice. We've been educating the next generation this way long before it was written down. Theo Audel tried in 1923. 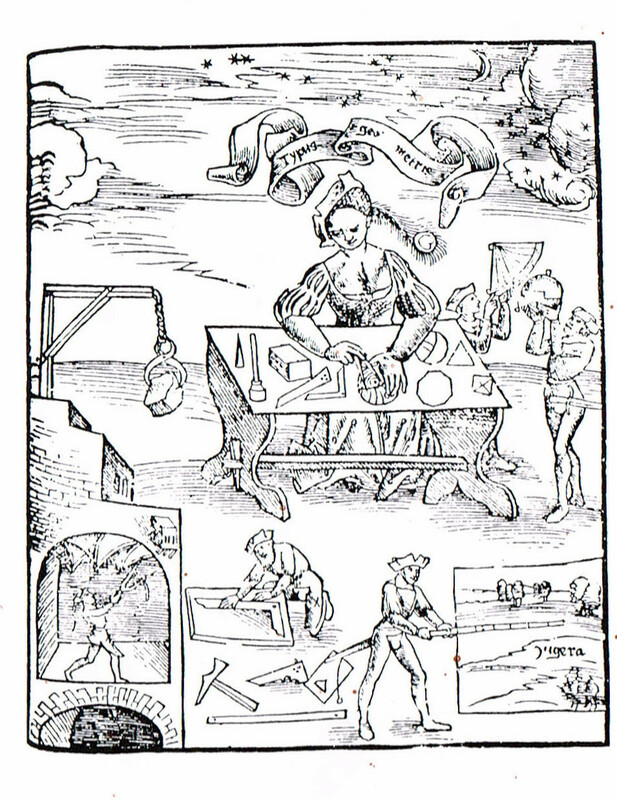 Audel's Carpenters and Builders Guide has 2 illustrations showing how to 'pluck' the Line. 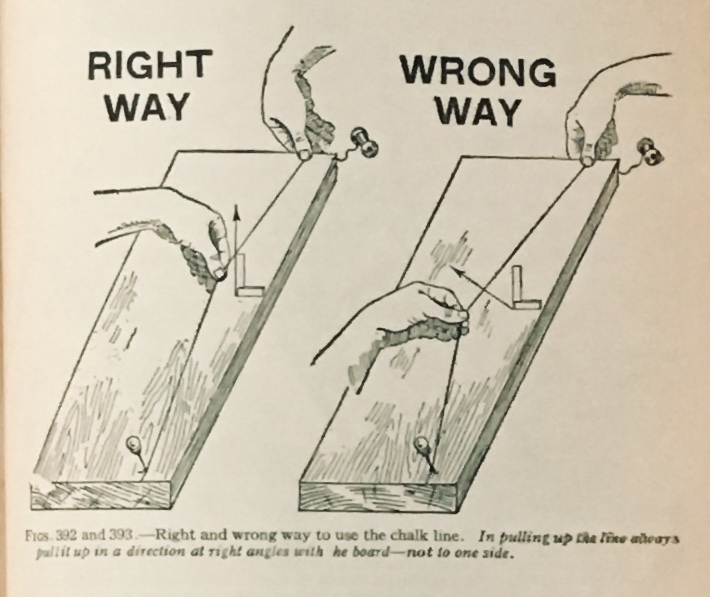 Other illustrations show how to set the Line with an awl. 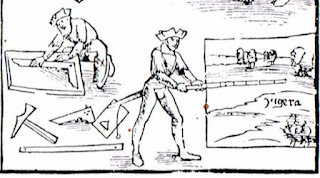 Here is his illustration of the Line with its reel and awl. He explains that "The line consists of a light string or cord" made of cotton or linen; that it can come in 20 ft., 50 ft., and 84 ft. hanks, on up to 450 - 600 ft. long lengths. That's a awfully long cord! In 1923, tape measures were still about 5 years in the future. We did have 6 ft long folding rules. 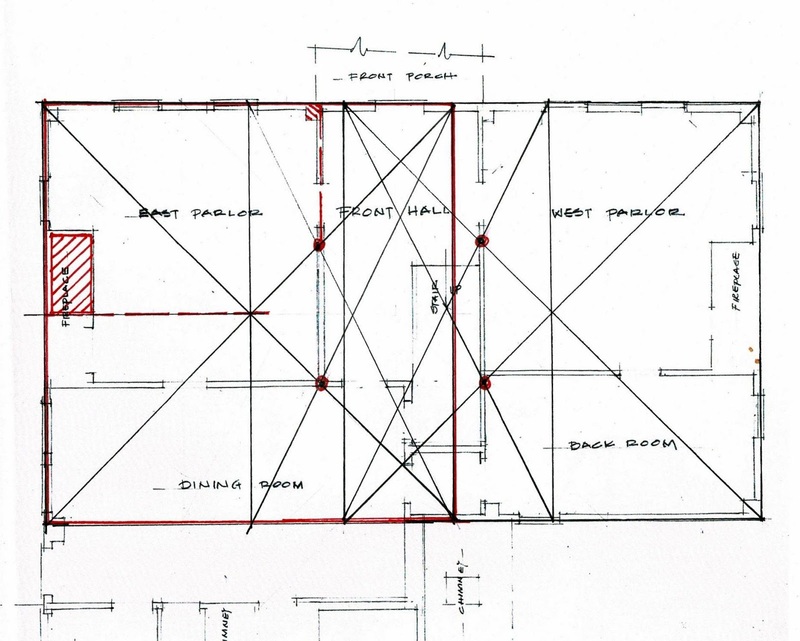 This one is mine: it helps me catch nuances in an existing building because I am close to what I need to document. The tape measure is better for overall dimensions. That word, 'Line' - the L capitalized - is often used in Practical Geometry. Serlio"s diagram and explanation is the earliest example I have found. The word was understood, not requiring any special explanation. 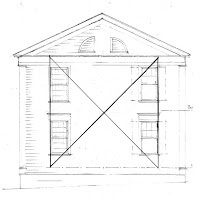 James Gibbs says about his drawings that they are "Draughts of useful and convenient Buildings ...which may be executed by any Workman who knows Lines,..."
Today we use Lines for setting a wall in a straight line. The Line is along, or off-set, from where the wall needs to go. We build to it. 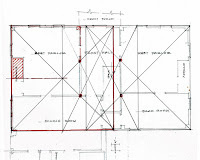 Rectangular foundations are 'trued' by checking with a Line that the diagonals match. 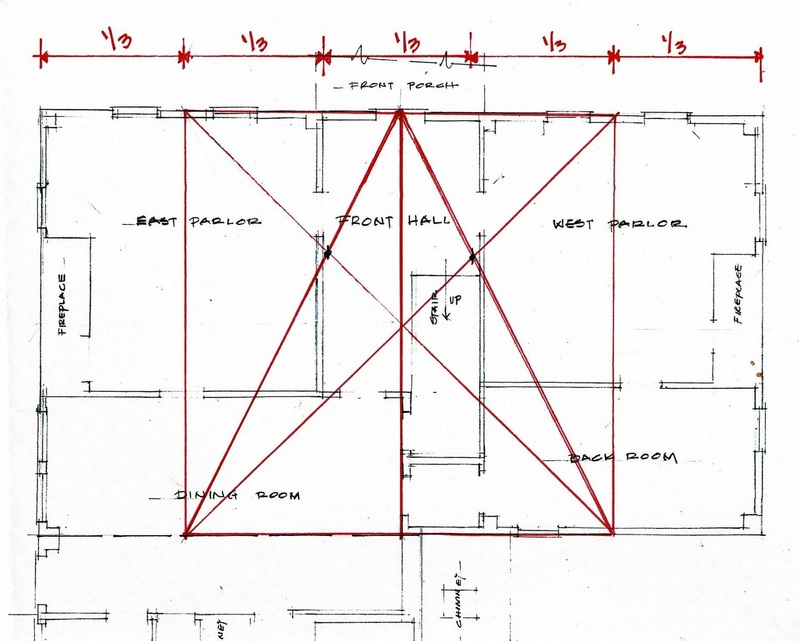 How would builder without 20th Century tools use a a Line to lay out a building? 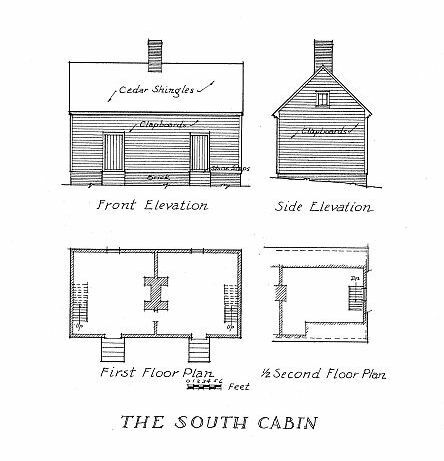 The slave cabin of Tuckahoe is an example. 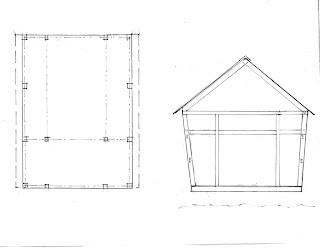 The carpenter knows how big he will make the cabin and what it will look like: 2 square boxes with roof, lofts, chimney, 2 doors and 2 windows. He starts with a Line (C-D) and its Perpendicular (A-B) - basic geometry that he can easily lay out with his cord. The Lines do not yet have length, just direction. He chooses his length for the width of the cabin: A-B. Probably he has a rod marked off with 5 or 10 units. See the illustration at the end of the post. He swings his cord in an arc using A-B as his radius from C through B to D. Now he has the width and the length of the cabin, and 2 corners. 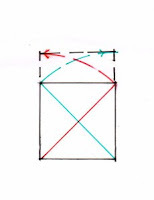 To find the other 2 corners, he moves to B and swings his arc from E through A to F.
For that he will stand at D and swing the cord from A to E. Where the cord intersects with the earlier arc will be the right rear corner, E. F will be determined the same way. Then he will check that his rectangle is true by running his diagonals F-D and C-E If they match, he is set. If not he will adjust his Lines. At no point does he need to use numbers. 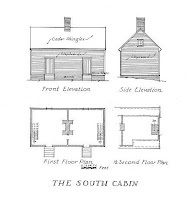 The walls of the cabin would be laid out on a framing floor with cord set from point to point, just as timber framers who work by hand do today. 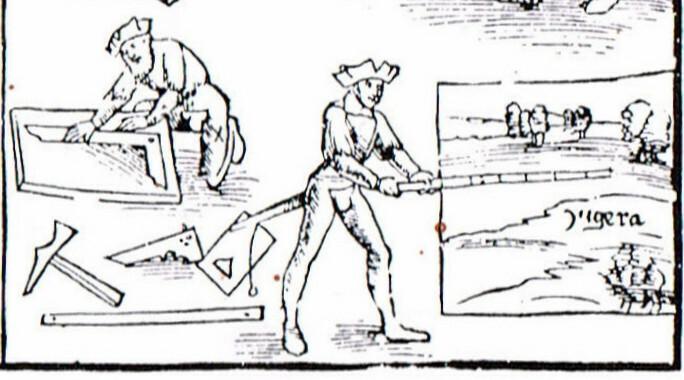 Here's a 14th c. wood cut showing a rod marked in 5 units. It may be longer; it may extend behind his body to end at the rectangle with the triangle at its end - which might be for plumbing a surface. C. 1800 pattern books refer to 10' rods. 16.5 ' rods were used to lay out acres. See my Bibliography for the books of Serlio and Gibbs referred to here. See also my posts on both men, and my posts on Tuckahoe Plantation. 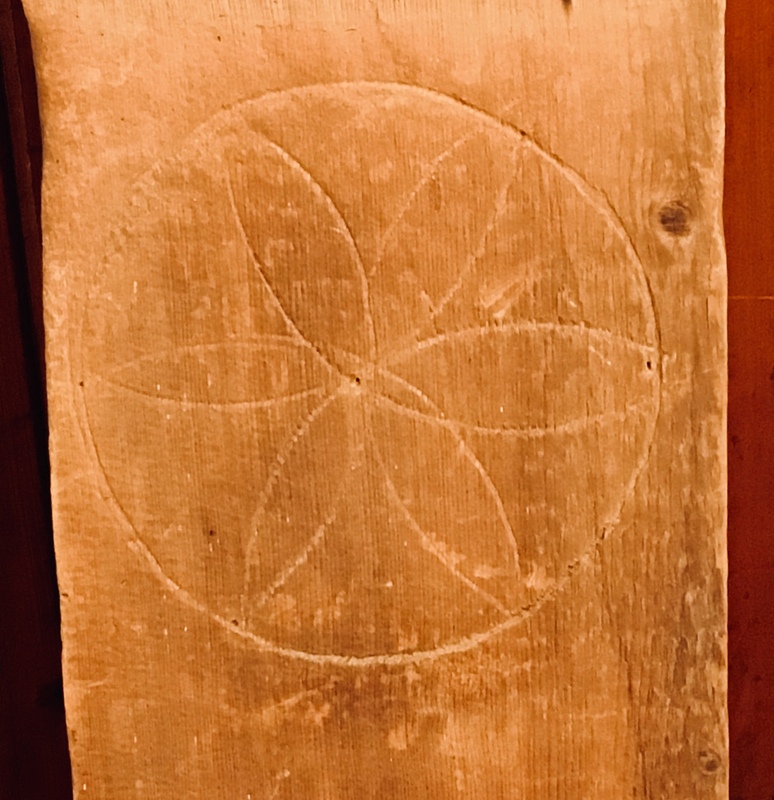 This daisy wheel, drawn by a compass, was on the wall of a barn in Vermont. Close examination shows that the center and the tips of the daisy's petals were regularly pricked. The radius and the diameter were regularly used as dimensions. Little. 17 ft by 21 ft , about 18 ft to the peak. New roof, south facade, and paint: c. 2015. Painting on going. New concrete blocks for piers; old concrete piers formed in wicker baskets. Door relocated for easier access on foot. The main door was on this elevation, about 3 ft above grade, ideal for access from a wagon. This south wall was rotting away. The corn crib deserved better. During the repairs we found that it is timber framed, scribed, the main framing beams hewn, others cut with a sash saw. It has log rafters. and may predate the c. 1810 house. The scribe marks are similar to others found in the neighborhood - a common framer? Or a common teacher of corn crib builders? Click on the photographs to enlarge them and read 'II', 'IIII', and 'III' on the posts and the beams. 'III' shows how water in that joint wore it away. I measured it - the width, length and height; the size of the posts and beams, and their locations; the roof pitch, the slant of the walls. I drew it up and checked my notes for clarity. The plan and elevation are below. The sides were for corn, the center aisle for work, the back (lower) section for grain, tools, equipment. The walls slope out to shed the rain and snow, and to keep the corn from locking in place. The beam running below the beam at the eaves supports the floor of the small loft above the back storage section. There is a ladder built into the wall for access. This is a normal corn crib for this section of the Hudson River water shed where New York, Massachusetts, and Vermont meet. It does not seem to be the usual way corn cribs are built in other parts of the country. I plan to look more carefully. Note: the geometry is right there. It does not need to be found. I need to recognize it! Looking at the floor plan I could see the posts in the upper section forming a square. I added the diagonal and then using the diagonal as a radius I swung an arc. It landed on the lower left corner of the crib. This is a simple easy plan. The elevation should be as simple. I tried a square based of the width of the floor (about 17 ft. wide). It didn't quite fit. I tried a square based on the width of the walls as they meet the roof (about 18 ft. wide). Again, not good enough. 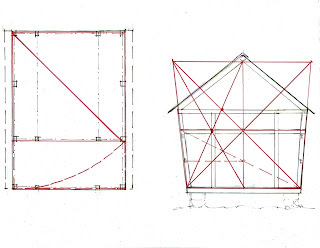 The utilitarian corn crib's frame needed to be as straightforward as its plan. The geometry tell the carpenter where to put his frame - exactly. Not within 4-5 inches. He will have timbers laid out on a framing floor. He will want lines (chalk lines or taunt twine) that tell him position, lengths, mortises. He needs no frills here. This is when I have a cup of coffee, clean up the office, walk to the mailbox. And think, "The carpenter began with the height of the corn crib equaling its width. He put the loft floor at half the height of the crib." I come back to try something else, experiment, play. 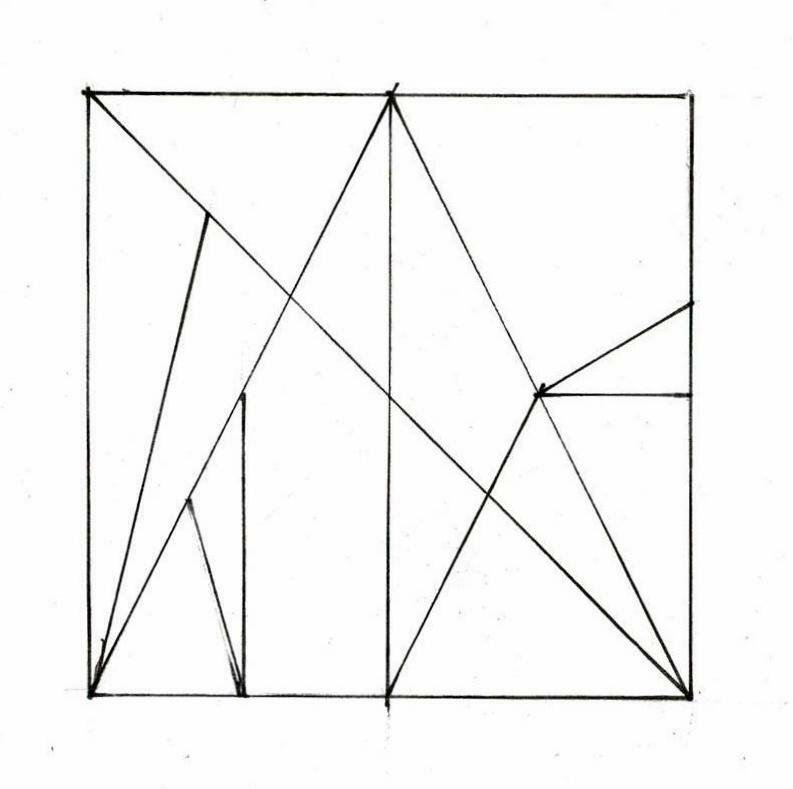 "What if I drew the 'square' using the angled walls? Why not?" It works. The Lines cross above and beside the framing members. 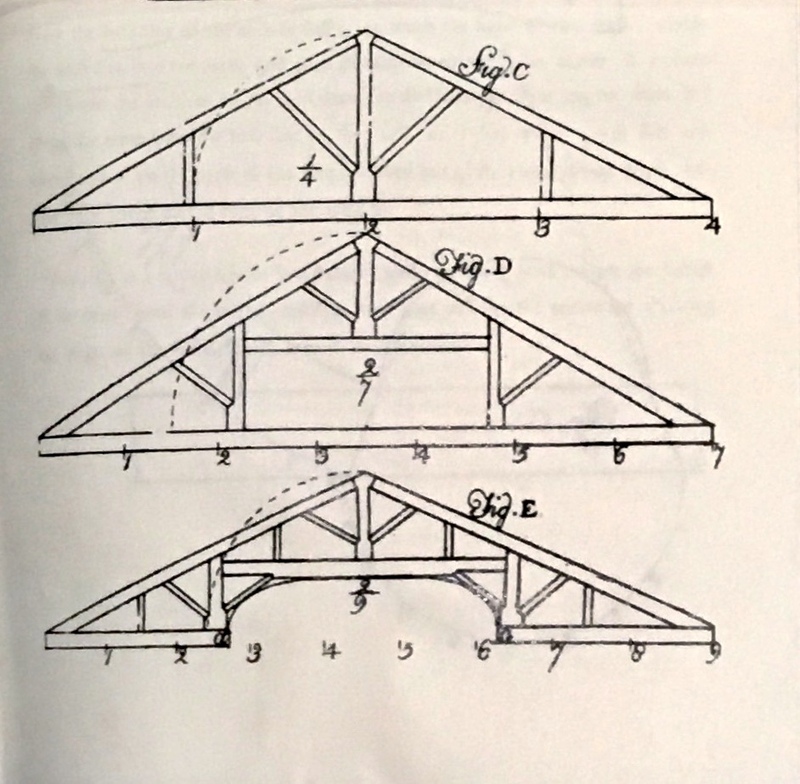 The trapezoid ends below the ridge telling the framer where to cut his joints on the rafters so they will lap each other. The side braces (dashed line) are easily located. The Lines on the framing floor will be beside the posts and beams, just as they are outside the edge of the plan. The Lines needed to erect the crib are as minimal as those needed to layout the floor. The Vail House was deconstructed this past summer for repair and reconstruction in another town. It was once one of the most stylish houses in Bennington, its architraves and columns more complex than most local houses, its fanlight and surround unique to this part of Vermont. Similar details exist on a few houses across the border in New York. The Victorian updating can be seen here - the double windows on the first floor, right, and the porch with curly brackets Well executed at the time and then let go. I measured and photographed it about 4 years ago. I wish I had documented it more carefully. I have no image of the front of the house! On September 16, I will include its geometry as part of my presentation 'Practical Geometry' for the Bennington Historical Society lecture series at the Bennington Museum. The family wanted a broad front hall with space for a sweeping staircase. This was the new style. The framer's answer was to add 1/3 of the width to each side. The red square in the center shows how this worked. It was divided into 3 equal parts using the Rule of Thirds. The house was to be 3 parts deep and 5 parts wide. As you can see the division into 3 is not quite where the posts and beams are. While the size was set by an addition of proportional lengths, the rooms were set by a different application of the Rule of Thirds . I call it 'Crosses Squares' . Each side is a square, the Rule of Thirds applied to each side makes the front rooms square, the back rooms long and skinny, The posts and beams are set where the walls will be. squares on each side towards each other about a 12" and the crosses squares would mesh. This is the west elevation. The shutters are a later addition. Here is the Practical Geometry: a square in the middle, with the left and right sides 1/4 of the whole. 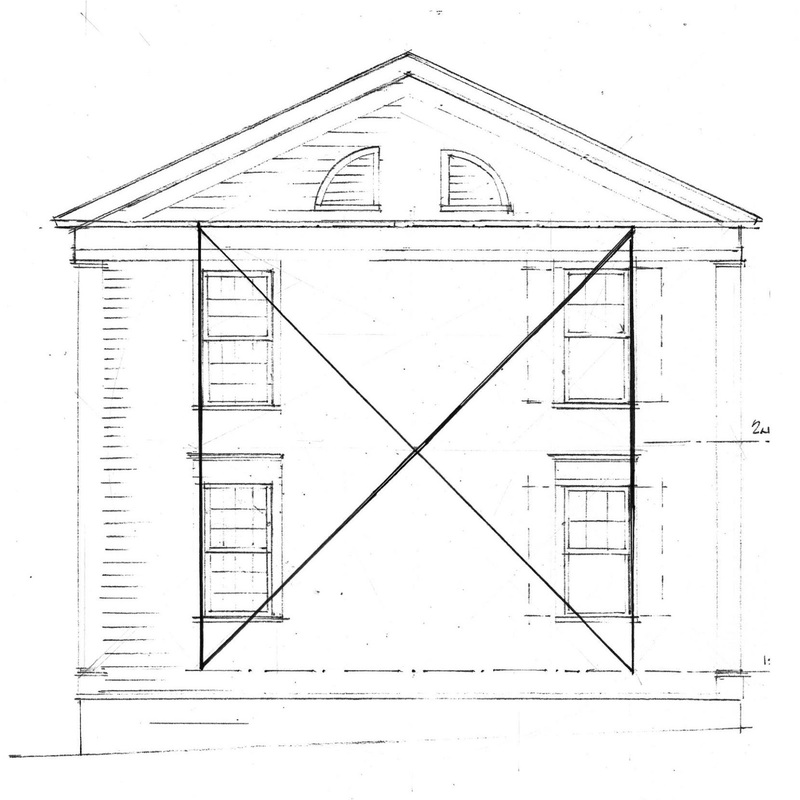 The Lines locate the windows' size and placement. The sash themselves are squares, which is in keeping with the layout. 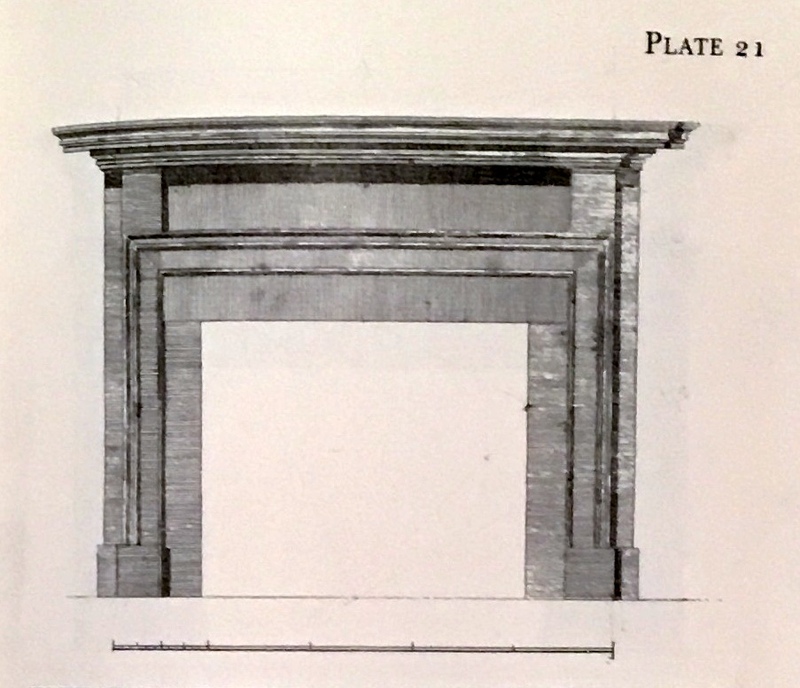 The decorative architrave's height is determined by the half of the square. As I did not measure the exterior extensively I have not tried to layout the geometry of the corner boards or the frieze. The photographs show that I have not accurately located the quarter circle vents in the eaves. They are farther apart than I drew them, The proper location is probably on the 1/4 line of the square. I think the roof pitch matches the Lines which divide the square into quarters - or the dash dot line I use to call out the left quarter of the house. This would be a logical choice: a natural choice, using proportions the framer already is working with and also complementing the design of the house.